*Author contributions: Padmakumar R performed surgical operation, designed the report; Pai M and Farish S contributed to the surgical operation, review of literature, data collection; Rajeev J contributed to the attending doctor for the patients (colonoscopy), editing assistance; Sanjeev T, anesthesiologist for the procedure, was responsible for the literature review; Sreevalsan TV was critical care specialist; Sheetal B and Sooraj YS were attending doctors for the patient; Rowther SS organized the report, statistics, and manuscript preparation. We were unable to find reports in the published medical literature of any cases of bowel surgery being successfully performed at such a low hemoglobin level, without blood transfusion or blood products pre or post-surgery, with the patient’s uncomplicated recovery. This study is about such a case. A patient presenting with severe gastrointestinal bleeding was diagnosed with enteric fever and multiple ileal ulcers. He had an extremely low hemoglobin level (2 g/dL) and mild renal and hepatic impairment. He was immediately admitted for right hemicolectomy under general anesthesia though he refused transfusion of blood or blood products prior to, during, or after surgery on religious grounds (Jehovah’ s Witnesses). After the surgery and having survived these potentially life-threatening circumstances, he left the hospital without major complications. In such circumstances, lives may be saved by prompt clinical decision-making, collaboration and swift surgical intervention coupled with the immediate consultation and input of the patient and family. Gastrointestinal bleed; Low hemoglobin level; Jehovah’s witnesses; Multiple terminal ileal ulceration; Enterotomy; Right hemicolectomy. It is unheard of in the medical history to take up a patient with hemoglobin of 2 g/dL for anesthesia and major bowel surgery, without transfusing blood or blood products prior to, during or after surgery; and saving the life without complications. We would like to report regarding such a patient who was treated at our hospital. Few, if any case studies in the published medical literature report on the successful, uncomplicated surgical outcome of a patient with hemoglobin of 2 g/dL for anesthesia and major bowel surgery, without blood transfusion or blood products pre or post-surgery. Thus, we would like to report our recent experience treating such a patient at our hospital. A 39-year-old male patient was admitted to Sunrise Hospital, Cochin, Kerala, India; after being referred from a nearby hospital [from where he left against medical advice] with a history of severe lower gastrointestinal bleeding. The diagnosis was enteric fever with bleeding from the gastrointestinal tract. Salmonella typhi “O” and “H” titer was 1/640, which was confirmed by tube agglutination test (stained febrile antigen set, Manufacturer- Span diagnostics ltd, Sachin, Surat, Gujarat, India). His hemoglobin was extremely low (4 g%) at admission. On examination, he was very pale and icteric, with a pulse rate of 120/beats per minute and blood pressure of 110/70 mmHg and mild distension of the abdomen was present. 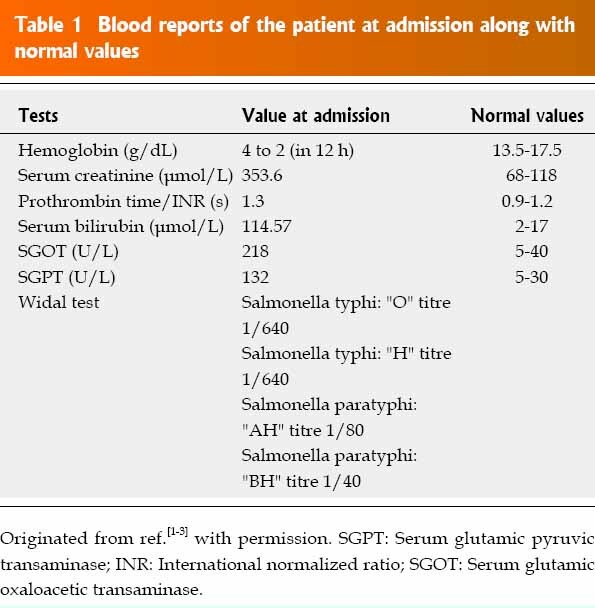 Table 1 shows the blood investigations of the patient at admission. An immediately performed colonoscopy showed multiple terminal ileal ulcerations with diffuse active bleeding that was not amenable to either colonoscopic or radiological intervention at that stage. Hence, immediate surgical intervention was planned. It was decided as absolutely necessary to transfuse blood and blood products to correct the hemoglobin level, which had dropped to 2 g/dL within 12 h of admission. We discussed with the patient’s relatives the urgent need for blood transfusion, before proceeding with surgery to arrest the ongoing bleeding. However, the patient, his wife and other relatives were firm in their decision not to receive blood or blood products, due to their religious beliefs. Giving erythropoietin alone at that time was not an option in this patient with active bleeding. Thus, we were faced with the option of not performing the surgery at all, but at the almost certain cost of the patient’s life. Wanting to give the patient the chance to survive, it was decided to offer the patient surgery, despite his clinical condition and the treatment constraints mentioned above that make for an extremely risky surgery. The patient was prepared for laparotomy with a high-risk consent that also listed the distinct possibility of death during surgery and the continued unwillingness to receive blood or blood products. The patient was given general anesthesia, during which minimal intravenous fluids were administered to maintain the blood pressure at 100/60 mmHg, as overhydration could lead to a further drop of in hemoglobin levels. The bowel was found to be thickened at the ileocecal region. Enterotomy was performed and linear ulcers with bleeding base were observed at the terminal ileum. Limited right hemicolectomy was performed, excising the distal 21 cm of ileum including the ulcer, cecum, appendix and a portion of ascending colon. The entire bowel was edematous,and the blood that oozed during resection appeared thin and watery. To reduce the duration of surgery, reconstruction was attempted by side-to-side ileocolic stapler anastomosis, but staplers did not hold due to bowel wall edema. Revision of anastomosis with hand-sewn, end-to-end, ileocolic two-layer suturing was performed with 3-0 Vicryl (polyglycolic acid)-continuous all coat and 3-0 silk, intermittent seromuscular. Postoperatively, the patient was kept in the intensive care unit for 10 d with nasal oxygen to enrich the available hemoglobin with oxygen. He had features of renal and hepatic impairment, which gradually improved (Table 2). 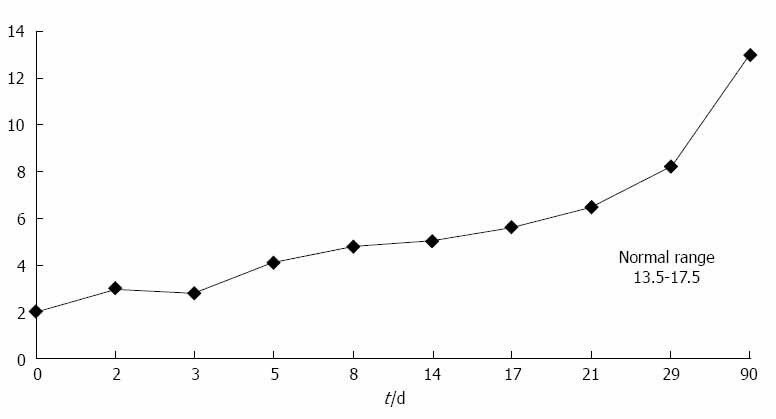 Improvement in hemoglobin level is presented in Figure 1. Total parenteral nutrition and albumin infusion were initiated. He was given intravenous ferric carboxymaltose and recombinant erythropoietin. Small doses of frusemide were given intravenously for the benefit of hemoconcentration. The patient was put on oral fluids on the fifth day of surgery, which was gradually switched over to soft diet by the seventh day. A high protein, high calorie diet was given together with oral iron supplementation. Gradually, his hemoglobin level improved, as shown in Table 2. The biopsy report showed linear ulcers in the distal ileum, with the largest measuring 1.5 cm. Microscopy showed a mucosal ulcer infiltrated by histiocytes, lymphocytes, plasma cells and occasional neutrophils consistent with typhoid ulcer ileum. No granulomas were present. We were unable to find reports in the published medical literature of any similar cases of bowel surgery being successfully performed at such a low hemoglobin level with the patient’s uncomplicated recovery. Various reports of surgeries performed without blood transfusion in severely anemic patients (hemoglobin level less than 5 g/dL) showed mortality of approximately 50%, which further increased to 91% in the 2 to 3 g/dL group. Figure 1. Improvement of hemoglobin during the course of treatment. Hemoglobin is the major oxygen-carrying protein in blood. Low hemoglobin level is generally defined as less than 13.5 g/dL for men and less than 12 g/dL for women. Unless it is very severe, anemia, perse, does not cause any problems with anesthesia or surgery. Severe anemia can precipitate cardiac arrest due to (1) increased cardiac output; (2) vasodilatation associated with anesthesia; and (3) hemodilution during resuscitation of hemorrhagic shock using saline. The degree of hemodilution is directly associated with acid base imbalance and is proportional to the level of compromise of metabolic recovery, which in turn is projected on to mortality. In addition, tissue hypoxia due to reduced oxygen-carrying capacity of the blood leads to end-organ damage and systemic immune response syndrome. There also is a risk of surgical site infection, delayed wound healing and bowel leak at the site of the anastomosis. Jehovah’s Witnesses are a Christian denomination with non trinitarian beliefs distinct from mainstream Christianity and have a worldwide membership of over 7.78 million people. Their beliefs are based on interpretations of the Bible and they prefer to use their own translation. They refuse blood transfusions, which they consider to be a violation of God’s law based on their interpretation of Acts 15:28, 29. Since 1961, the willing acceptance of blood transfusion by an unrepentant member has been grounds for expulsion from the religion. Watch Tower Society literature directs Witnesses to refuse blood transfusions, even in “a life-or-death situation”. They refuse transfusions of whole blood or of any of its four primary components - red cells, white cells, platelets and plasma (serum)[7,8]. It is always a dilemma for the surgeon to decide whether to urgently operate on a bleeding patient with hemorrhagic shock without blood transfusion. We believe that life-saving interventions should not be delayed for patients with active bleeding, even though blood transfusion may be refused. Atabek and colleagues have reported a case of active bleeding in a Jehovah’s Witness patient, where early surgery led to rescue of the patient. Initial conservative treatment with delayed surgery led to a 75% mortality rate, compared with a 20% mortality rate in patients who underwent emergency surgical intervention within 24 h of admission to the hospital[10,11]. Our patient was at high-risk for cardiac arrest due to oxygen depletion, but eventually survived without complications. Anastomotic site healing was also potentially in jeopardy, but he recovered without leak. In conclusion, even in the rarest of situations, such as the one described, a successful attempt to save the patient’s life can be made, even though the general condition of the patient is clinically unstable. Prompt decisionmaking and effective communication among the treating doctors and with the patient and his relatives were important factors that helped the patient’s positive outcome. Had the clinical team refused to perform surgery on this patient, or even delayed the operation because of his extremely low hemoglobin, death would likely have been assured.